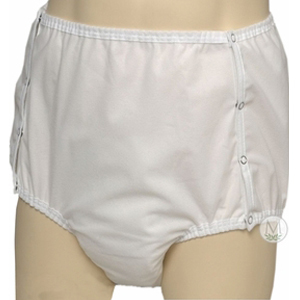 All-in-one, pull-on brief with moderate to heavy absorbency. It is a reusable, brushed polyester brief with a newly designed, waterproof safety pocket. Keeps liquids locked into a multilayer soaker. It is latex-free. Reusable Brushed Polyester Brief with newly designed, waterproof safety pocket. Keeps liquids locked into a multilayer soaker. For men and women with heavy incontinence.